When clicking on items in the Conversation History folder, Outlook may hang or display the "Not responding" message. This issue may also occur when clicking on Skype items and email voice mails. For more information on this issue, please go to Outlook hangs when clicking in Conversation History folder. When an on-premise Outlook user opens the Scheduling Assistant to book a meeting, cloud users Free/Busy shows as slashed lines. This will normally occur if the user added to the meeting has time blocked on their calendar with availability as Working Elsewhere. Until a fix is available, you can use Outlook Web App (OWA) to schedule the meeting as a workaround or you can ask the user with Working Elsewhere availability to switch it to Free or Busy. For more information on this issue, please go to Free/Busy shows slashed lines in Scheduling Assistant. Starting with Version 1802 (Build 9029.2167) Outlook introduced an update that treats changes to a meeting’s attachments, subject, and body as updates which must be sent to all attendees. Based on customer feedback, Outlook will remove body changes from triggering updates to all attendees. After updating to Version 1803 (Build 9126.2072), you may find that when you open an existing meeting in the calendar and send an update with updated location, the recipient still sees the old location. If you review the item in the Sent Items folder it shows the old location and was not updated. Note: This issue only affects Semi-Annual Channel (Targeted) and Monthly Channel (Targeted) versions using builds 9126.2072 and higher. This issue is fixed by a change in the service. Restarting Outlook should fix the issue but you may have to restart Outlook up to three times to pick up the change. Information for this issue is also provided in this article: Meeting location updates are not reflected in recipient calendar in Outlook 2016. When you send emails you may find that the email appears blank. This issue happens most often with add-ins that leverage the Send To Mail Recipient functionality and MAPI integration. This issue is fixed in Monthly Channel Version 1802 (Build 9029.XXXX) or higher. To get the latest update immediately, open Outlook and choose File > Office Account > Update Options > Update Now. Information for this issue is also provided in Outlook sends blank emails. When you print your calendar you find that it switched from printing in color to black and white. The issue occurs on Outlook 2016 version 8901.xxxx and higher. This issue occurs because the Outlook team fixed a bug to respect the setting "Print using grey shading". To print the calendar in color, disable the "Print using grey shading" setting in Page Setup under Print Options. Full steps can be found in the following article: Outlook 2016 calendar printing switched from color to black and white. When you click the Signature button, Outlook hangs and you are not able to add a signature. This issue occurs if you install and Office subscription on a PC that pre-installed Microsoft Office desktop apps. You may be unable to search or cannot see MailTips or Free/Busy. This issue occurs in Build 8420.xxxx and higher. When you view multiple calendars at the same time and stack them on top of one another in an overlay view, you can't view appointments from the other accounts. This issue started in Version 1712 (Build 8827.2148). The issue is fixed in Monthly Channel Version 1712 (Build 8827.2179). To get the latest update immediately, open Outlook and choose File > Office Account > Update Options > Update Now. Information for this issue is also provided in Calendar overlay does not show appointments for additional account. When you add new users to an existing meeting and choose Send updates only to added or deleted attendees the meeting location is not preserved. For Outlook 2016 (Click To Run), the issue is now fixed in service in builds 8502.1000 and higher. To get the latest update immediately, open Outlook and choose File > Office Account > Update Options > Update Now. For Outlook 2013, the issue is planned to be fixed in the February Public Update for versions 15.0.5007.1000 and higher. Information for this issue is also provided in Missing meeting location after adding new users to the meeting. If you have two different Exchange accounts (including Outlook.com) in your Outlook 2016 profile, and you mark emails for follow up on both mailboxes, the subjects and details of the emails are not visible in the To-Do Bar or the Tasks View. Information for this issue is also provided in To-Do Bar and Task List view not displaying events. After installing the January Update for MSI versions of Outlook, attachments are removed when forwarding emails in plain text. To fix this issue, please download update 4011123 from the download center. Information for this issue is also provided in Attachments are removed when forwarding plain text emails. After updating Outlook or Office to version 16.0.8827.2062, searching using the All Mailboxes option shows no results. After updating Outlook or Office to version 16.0.8827.2062, searching using Find Related option shows no results. After updating Outlook 2010 on Windows XP to the January Update, Outlook fails to start with the error: "Outlook.exe-Entry Point not found. The procedure entry point CompareStringOrdinal could not be located in the dynamic link library KERNEL32.dll". Microsoft has released KB 4018314 to fix the issue. The fix will also be released by a scheduled monthly update planned for March 6th. After updating Outlook 2016 to Build 8625.2121 or higher, local contact groups do not auto-resolve with Autocomplete. Our engineering team is aware of this issue and working on a fix that should be available soon. For the most recent information on this issue, go to Contact Groups are not searchable with Autocomplete. After updating to the Monthly Channel Version 1710 (8625.2121) build or higher, the View Settings button is missing. For the most recent information on this issue, go to Missing View Settings button in Outlook 2016. After installing the October Public Update, folder home pages no longer appear and the Home Page feature is missing in Outlook folder properties. This feature was disabled by default to limit security vulnerabilities. This affects Outlook 2010, Outlook 2013, and Outlook 2016. For the most recent information, go to Outlook Home Page feature is missing in folder properties. After Modern Authentication is disabled, users may intermittently get prompted for their credentials in Outlook 2016 and have to repeatedly enter their username and password. Note: Fiddler traces reveal 401/403 authentication failures to this endpoint: "https://outlook.office.com/api/v2.0/Me/InferenceClassification"
This scenario can occur if Focused Inbox and Modern Authentication for the tenant is turned on and then Modern Authentication is turned off. When this happens, Focused Inbox has already started working and keeps trying to connect resulting in these credential prompts. For the most recent information, go to Outlook 2016 prompts for credentials after disabling Modern Authentication. After installing the October Public Update for Outlook 2010 or Outlook 2013, you may get this error in the folder pane display when you click on folders in the Business Contact Manager pane: We didn't find anything to show here. Additionally, an error dialog appears with this error: Business Contact Manager for Outlook could not complete your last action or actions. Please try again. For the most recent information on this issue, go to "Business Contact Manager could not complete your last action or actions" error in Outlook 2010 or 2013. After installing the September Public Update, Outlook 2007 displays mixed languages in the user interface. Please follow the instructions in KB 4011086 to uninstall it, and then install KB 4011110. Custom form script is now disabled by default and requires setting registry keys to re-enable it. The new registry key has a default value of 1, which indicates form script should not run. Then create DWORD (32-bit) Value 0 and set the name to DisableCustomFormItemScript to enable custom form scripts. Then, create REG_SZ values in this key for each form you wish to allow scripts to run. In the above example, you would create a REG_SZ value named “IPM.Note.Custom” with empty data. When designing a form, Run This Form will run a form using the message class of the base form. So if you started designing an IPM.Note form and want to Run This Form, you will need to have IPM.Note registered. After you publish, the published message class is what will be checked. Once you have finished designing your form and published it to a custom form name, remove the standard “IPM.Note” from the trusted list. You need to restart Outlook after setting the TrustedFormScriptList key. The example registry keys use 16.0 for Outlook 2016. Use 15.0 for Outlook 2013, 14.0 for Outlook 2010 and 12.0 for Outlook 2007. Click File > Options. Then select Trust Center > Trust Center Settings > Email Security. Under the Script in Folders section, click the checkbox for Allow script in shared folders and Allow script in Public folders and click OK and OK again to close out the windows. The change was first introduced in the September 12th, 2017 Outlook Public Updates and is included in the following MSI updates which now require the registry keys. Monthly Channel (Current Channel) will start supporting the registry keys in the update scheduled for September 18th release build 16.0.8431.2079. Semi-Annual Channel (FRDC) supports the registry keys with build 16.0.8431.2079. Deferred Channel supports the registry keys with build 16.0.8201.2193. Deferred Extended status is TBD. Insider Fast status is TBD. Insider Slow supports the registry keys with build 16.0.8431.2079. This occurs because custom form script is now disabled by default. Please follow the steps provided in Issue #2: Custom form script is now disabled by default which is just above this issue. Earlier this year we introduced the new Outlook.com, which helps you focus on what matters, collaborate effortlessly, and get more done. As part of the upgrade, we are also moving accounts to a more secure and reliable infrastructure. The upgrade impacts all Outlook, Hotmail, Live, or MSN email accounts. Once your Outlook.com account has been upgraded, you’ll need to reconnect Outlook 2016 or Outlook 2013 to your Outlook.com account to ensure the best experience and fix issues. To check if your account has been upgraded, login to your account through a web browser and compare your mailbox with the images below. If you do not reconnect your upgraded email account, you will soon no longer be able to send or receive Outlook.com emails via your desktop version of Outlook 2016 and 2013 until you reconnect. Additionally, by not reconnecting, you may experience email and calendar sync issues that will be resolved once you reconnect. You will still be able to send and receive emails via the web on www.Outlook.com. For detailed instructions and help on how to reconnect your account, please visit this article. Note: This change only affects any Outlook.com accounts you are accessing via Outlook 2016 or Outlook 2013. You do not need to reconnect to your other email accounts, such as Office 365, Exchange, or other third party email accounts. You can also continue to send, receive, and access email from your Outlook.com account on the web via any popular web browser. Your email account name shows up as outlook_[long series of letters and numbers]@outlook.com in the Folder Pane and when composing emails using Outlook for Windows. Recipients will also receive the email from the sender with the outlook_[long series of letters and numbers]@outlook.com format. This issue only impacts customers using Outlook for Windows. Emails sent via Outlook.com on the web works correctly and emails will be sent with the correct email address. The Outlook client does not currently support using a non Microsoft domain primary alias. For the time being to get the account to work in Outlook you need to change the primary alias to a Microsoft domain account, such as @outlook.com or @hotmail.com.. The Outlook Team is doing work that will enable some supported use of aliases in the near future. We will update this topic as soon as the functionality is available. Note: ﻿If you do not have another alias, click the link on the page to create one "Click Add email and a new alias". 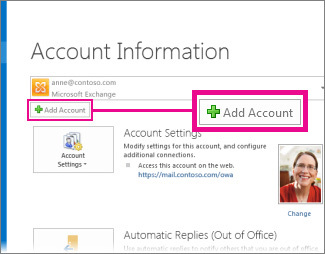 Then choose the option "Create a new email address and add it as an alias"
Go to https://account.live.com/names/Manage and sign in to your Outlook.com account. Set your Outlook.com email as the primary alias. If Outlook is connected to a primary Outlook.com account that is also connected to other secondary non-Microsoft accounts (such as Gmail, Yahoo, etc. ), when sending an email in Outlook, you are not able to choose the other secondary connected account as the "From" sending account. If you manually type in the secondary connected account email address in the "From" field, the email is sent as "On behalf of" your primary Outlook.com account. Outlook supports sending from a secondary connected account for Microsoft owned domains such as @outlook.com, @live.com, @hotmail.com but has not implemented this functionality for third-party domains. You can also add the secondary connected accounts (Gmail, Yahoo, etc.) in Outlook.com as additional accounts in the Outlook profile. In Outlook, choose the File tab. Under Account Information, choose Add Account. On the Auto Account Setup page, enter your name, email address, and password, and then choose Next. Note: If you receive an error message after choosing Next, double check your email address and password. If both are correct, see the next section. For more information, please see Outlook email setup. When connecting in Outlook as an Exchange account, you are unable to configure your personal custom domain email account. Add a CNAME record to your DNS settings at your domain registrar. A CNAME record is needed for Outlook to configure the account using Autodiscover. The only record you need to add is for Host Autodiscover. Verify your MX record is still configured for Hotmail. An MX record ensures you can receive email from other people. Currently, you can't use Outlook on Windows to edit calendars that are shared with your Outlook.com account, even if you've reconnected your Outlook.com account to Outlook. We're working to make it possible to edit shared calendars in Outlook 2016 for Windows. To edit a shared calendar, go online to your own Outlook.com calendar, open Calendar for Windows 10, or use a mobile device. Read how to Add your Outlook.com account to another mail app. 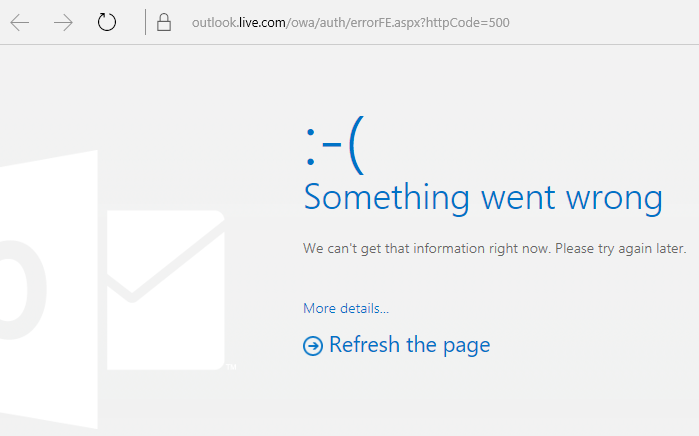 When you try to accept a shared Outlook.com calendar using your Office 365 for business account in Outlook 2016, you might receive the "Something went wrong" error or your sign-in might fail. To access the calendar shared with your Office 365 for business account, you’ll need to accept the invitation from Outlook on the web, iOS, or Android. If you've already clicked the Accept button in Outlook 2016, you won't be able to re-accept the invitation from another Outlook application. The person who sent you the invitation will need to remove your permissions and then send a new invitation. The issues documented in this section have been reported after installing the recent updates listed below. We're investigating the issues and will update this page when a fix is available. In the meantime, please use the workarounds suggested for each issue. Note: Please also see this article for an update on this issue: Custom form script is now disabled by default. This issue affects Outlook 2007, Outlook 2010, Outlook 2013, and Outlook 2016. If you’re an Office 365 customer, the fix is now available to Insider Fast audience. For other channels, an update is scheduled for mid-September, in versions 16.0.8418.5703 and later. We will update this page when the fix is released. This issue affects all Outlook versions on Windows 7, Windows 8, Windows 10. When searching in Outlook, you get this error: “Something went wrong and your search couldn’t be completed.”, or "Search results may be incomplete because items are still being indexed". Note: The fix for this issue has been released on June 27, 2017. If you implemented the workaround to disable Windows Desktop Search Service, you can now set the PreventIndexingOutlook registry key to DWORD: 0 to go back to using Windows Search. OST files are typically stored at C:\Users\<your username>\AppData\Local\Microsoft\Outlook. To find the name and location of the OST file, click File, Account Settings, Account Settings, Data Files. Locate the correct email address, click on the name, and click Open File Location. Before you can delete the OST file, you need to close Outlook so the process will release the file. After deleting the file, restart Outlook and let the email sync again. Another workaround is to Create a new Outlook profile, and add your accounts to the new profile. We recommend keeping the old profile until you know you have moved over any local data or PST files. Until you can install the Windows Update fix release, you can set a registry key that will cause Outlook to stop using the local Windows Search service. When this registry key is set, Outlook will use its own built-in search engine. The built-in search will display the message below to indicate it is not using the Windows Search service. Note: The following steps show you how to modify the registry. However, serious problems might occur if you modify the registry incorrectly. Please make sure that you follow these steps carefully. For added protection, back up the registry before you modify it. Then, you can restore the registry if a problem occurs. For more information about how to back up and restore the registry, see this article. On the Edit menu, point to New, and then click New Key and name the key Windows Search. Click on the new key Windows Search. Type PreventIndexingOutlook for the name of the DWORD, and then press Enter. Right-click PreventIndexingOutlook, and then click Modify. In the Value data box, type 1 to enable the registry entry, and then click OK. Note to disable the PreventIndexingOutlook setting, type 0 (zero), and then click OK.
Exit Registry Editor, and then restart Outlook. iCloud fails to load properly in Outlook 2007, Outlook 2010, Outlook 2013 and Outlook 2016. The set of folders cannot be opened. MAPI was unable to load the information service C:\PROGRA~2\COMMON~1\Apple\Internet Services\APLZOD.dll. Be sure the service is correctly installed and configured." The loading of unregistered MAPI services has been disabled by default to make Outlook more secure. If you're using Outlook 2010, Outlook 2013 or Outlook 2016, uninstall and re-install iCloud to resolve this issue. For more information, see this page. Warning: This workaround may make your computer or your network more vulnerable to attack by malicious users or by malicious software such as viruses. Microsoft does not recommend this workaround but is providing this information so that you can choose to implement this workaround at your own discretion. Use this workaround at your own risk. Value 0 (default): Block loading of unregistered MAPI services. This is the recommended setting to avoid unexpected execution of unknown code. Value 1: Enable loading of unregistered MAPI services. Important: The following steps show you how to modify the registry. However, serious problems might occur if you modify the registry incorrectly. Please make sure that you follow these steps carefully. For added protection, back up the registry before you modify it. Then, you can restore the registry if a problem occurs. For more information about how to back up and restore the registry, see this article. Type AllowUnregisteredMapiServices for the name of the DWORD, and then press Enter. Right-click AllowUnregisteredMapiServices, and then click Modify. Note: To disable the AllowUnregisteredMapiServices setting, type 0 (zero), and then click OK.
MAPI does not validate that a provider’s DLL that it is requested to load is registered correctly in MapiSVC.inf or even that it comes from the local machine. This can be exploited by creating a file together with an OLE object in such a way to cause MAPI to load a DLL from a network share when the OLE object is activated. This can allow arbitrary code execution to occur. Some Web-based Outlook add-ins don't work in Outlook when using on premise Microsoft Exchange 2013. This only applies to the MSI installations of Outlook 2016/Office 2016. Click-2-Run installations are not affected. The Office App add-in may show an Operation Failed error or seem to not respond to button presses or other UI choices. We're investigating the issue and will update this page when a fix is available. Outlook crashes when you click File > Options, and you see the error below. This issue only affects First Release for Deferred Channel Version 16.0.8201.2158. This issue is fixed in Semi-Annual Channel (formerly First Release for Deferred Channel) build 8201.2162 released in August 2017. This issue is also fixed in Deferred Channel build 8201.2209 released in November 2017. For more information about when builds are available for their respective channels, go to Update history for Office 365. After updating Office, you may experience a brief flashing window every hour, which triggers the OfficeBackgroundHandlerRegistration task to start running. This issue is now fixed in Version 1705 (Build 8201.2075). To get the update Office, open any Office 2016 app and choose File > Account > Update Options > Update. Outlook 2016 freezes when you try to preview an Excel file that’s attached to an email. Please install the Windows 10 Fall Creators Update to fix this issue. When you try to configure a secondary account from the same Office 365 tenant in Outlook 2016 (Current Channel) with ADAL enabled, you receive the following error: "An encrypted connection to your mail server is not available. Click Next to attempt using an unencrypted connection." This issue is fixed in Office Insider Build 16.0.9124.2004 and higher. The fix will be available for Monthly Channel versions later in March. The fix is currently only available in Insider build 16.0.9124.2004 and higher. It will eventually be made available to Monthly Channel versions later in March. For Semi-Annual Channel and Semi-Annual Channel (Targeted) versions, please disable ADAL on the client as a workaround. To do this, follow these steps to Disable modern authentication on devices. Right-click the Windows Start menu and choose Run. Type Outlook.exe /profiles and press OK. When Outlook starts, click New in the Choose Profile window to create a new profile. 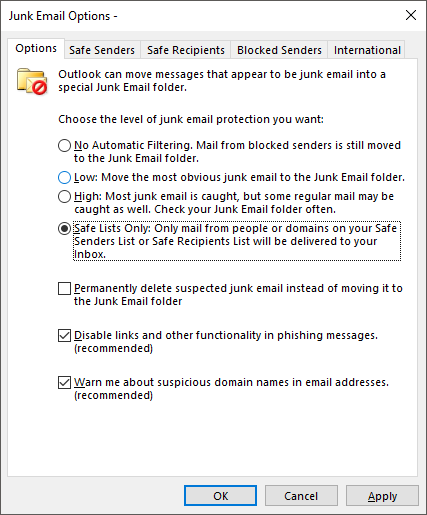 For IMAP and POP accounts, if you configure the Junk Email Options to Safe Lists Only, and send multiple emails from an unsafe email account afterwards – the initial email will go to Junk Mail, the rest will continue to arrive in your Inbox. The issue is fixed in Monthly Channel Version 1709 (Build 8528.2139). To get the latest update immediately, open Outlook and choose File > Office Account > Update Options > Update Now. 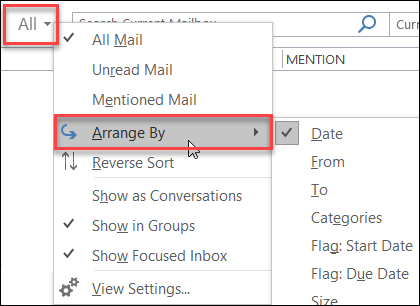 You may notice that All, Unread , Mentioned and other sort and filtering options, such as By date, and Newest are missing in Outlook above your email list. If your Outlook version is 1703 (Build 7967.2161) or higher, the filters and sort options were moved under the All drop down menu, to accommodate space for the new Focused inbox. Note: If you don't know your Outlook version, go to File > Office Account to check your Outlook version. To sort your emails by Unread, Mentioned or use other filters, select the All button and choose one of the options. You can also select Arrange By and then pick one of the options such as Date, From, etc. Another options is to use the Filter Email button on the ribbon. For more information, see Filter email messages. Note that you can quickly tell how your mail is currently sorted, by the presence of a small triangle on the field headers. To access the filtering options faster, add them to your Quick Access Toolbar. Click anywhere in the Search box. When the Search tab commands become available on the toolbar, right-click the Unread icon, and then select Add to Quick Access Toolbar. Right click the Ribbon and click Customize the Ribbon. Under the Customize the Ribbon Main Tabs , click the Home (Mail) > New Group. Select Rename, and rename the new group to Arrange. In the Choose commands from column, select All Commands. Scroll down to Arrange By, select the third Arrange By and click Add. Click the name of the new group (Arrange By) under Customize the Ribbon, and click the UP arrow to move it under the Respond group. You can change this later if you want to move it somewhere else. Click OK. This will add the new group on the Ribbon. To add Arrange by to your Quick Access Toolbar, right click on the new Arrange By button and click Add to Quick Access Toolbar. There is currently no option to revert to the prior behavior, but we would love to hear your feedback to help us with future designs . Please visit the Outlook User Voice page, and let us know what you think of these options. Outlook forwards meeting invitations to other attendees without anyone actually sending an update or forwarding an invite. This happens to accounts that are configured in the iOS Mail app. This issue is fixed. Please install the latest updates on your phone to resolve the issue. Customers on Current Channel major version 16.0.8326.2062 are not able to edit shared calendars. You don’t have permission to create an entry in this folder. Right-click the folder, and then click Properties to check your permissions for the folder. See the folder owner or your administrator to change your permissions. Cannot display the folder properties. The folder may have been deleted or the server where the folder is stored may be unavailable. Cannot display folder properties. You don’t have appropriate permission to perform this operation. The fix for this issue is being released in build 16.0.8431.2079. To install the update immediately, please go to File > Office Account > Update Options > Update Now. When you scroll up or down, the view jumps to a different position after you finish scrolling. When you delete a message, the focus jumps elsewhere in the view instead of jumping to the message before or after the deleted message. See Version and build numbers of update channel releases. Current Channel: See workaround below. A tool available to Office 365 for business subscribers, the Support and Recovery Assistant for Office 365 will run a series of diagnostic tests on your computer and help you set up a new profile, or resolve other issues. If any of the tests fails, it will provide suggested solutions to get your problem solved. Note: Support and Recovery Assistant for Office 365 is currently only available for use by Office 365 customers. CalCheck checks your Outlook calendar or general settings for problems, such as permissions, free/busy publishing, delegate configuration, and automatic booking. It also checks each item in your calendar folder for known problems that can cause unexpected behavior, such as meetings that seem to be missing. If you have an Office 365 for home subscription, or you purchased a one-time download of Office 2016, click the Contact Uslink at the bottom of this page. You can send feedback directly to our Office teams:. In Office 2016 on Windows 10, open an Office app, and click File > Feedback. We love reading your suggestions on new features and feedback about how you use our products! Share your thoughts on the Outlook UserVoice site. We’re listening.